Indulge in a casual beachfront dining experience at Castaway Café. The menu features cuisine with island flavors that are inspired by the Pacific region. You’ll love the diverse menu offering delicious salads, sandwiches, seafood, burgers, and a nightly fresh fish selection. Dine al fresco, gaze out at Pacific Ocean, and enjoy romantic sunsets during dinner with the islands of Lanai and Molokai in the distance. Castaway Café is surrounded by towering palms and is located between the resort’s swimming pools and the ocean. 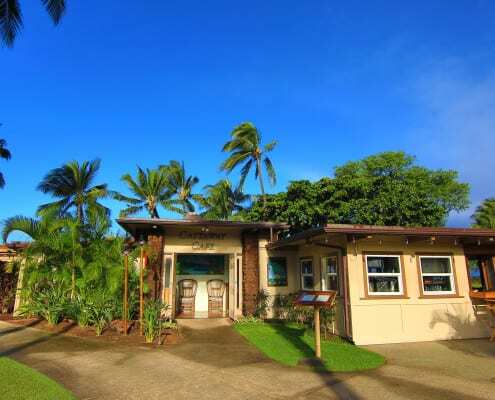 For reservations, call (808) 661-9091. Pineapple & Orange Juice, Grenadine, Light, Dark and 151 Rum. Castaway’s Version of the Zombie. Tuesday evening features a delicious two-for-one pasta feast. Saturday night enjoy our savory Prime Rib Dinner Special. Sunday night offers a BBQ Rib Dinner Special from 5:00 to 9:00 pm. Pupu and Lighter Fare served from 2:30 to 9:00 pm.